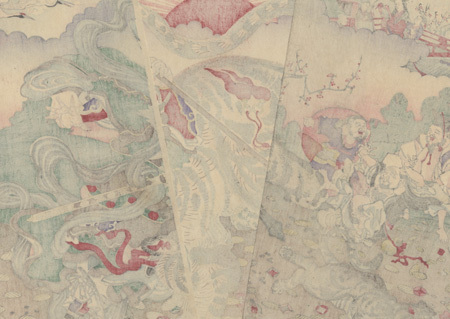 Comments - Fantastic triptych showing Bishamonten, the God of War and one of Japan's beloved Seven Lucky Gods, hunting tigers. 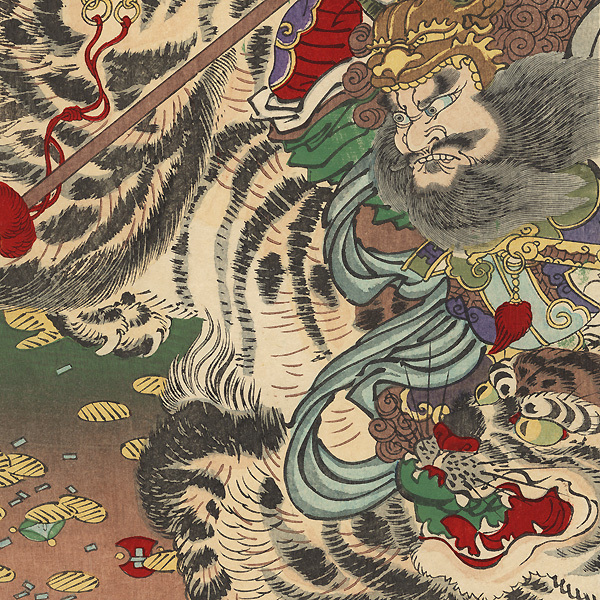 In the center, he kneels atop a thrashing tiger as he aims his pole arm at an escaping cub. The animal snarls and whips its tail as Bishamonten bites his lower lip in concentration, his eyes bulging from beneath a demon-headed helmet, blue sashes fluttering around the figure. At left, five of the other Seven Lucky Gods watch from the left, Hotei tumbling backwards as he scrambles to get away. Gold coins are scattered across the ground, and the only female Lucky God, Benzaiten or Benten, can be seen at upper left beyond a border of clouds. A deep red sun rises in the center, and lucky cranes fly across the sky at left. An incredible, wonderfully animated design, beautifully detailed. A great choice to collect or display. The first time we've come across this Kyosai subject. Condition - This print with excellent color and detail as shown. Three separate panels. A few creases. Please see photos for details. Nice overall.